While they may make your clothes smell as fresh as a spring morning, conventional laundry-care products often contain chemicals with negative health effects ranging from skin and throat irritation to carcinogenicity. In fact, the laundry room may be one of the more toxic areas in your home. Researchers have found that dryer vents can emit more than 25 volatile organic compounds (VOCs) when scented laundry detergent and dryer sheets are used, including seven VOCs classified as hazardous air pollutants. This is particularly concerning when dryers don’t vent outside or are blocked, causing indoor air pollution. 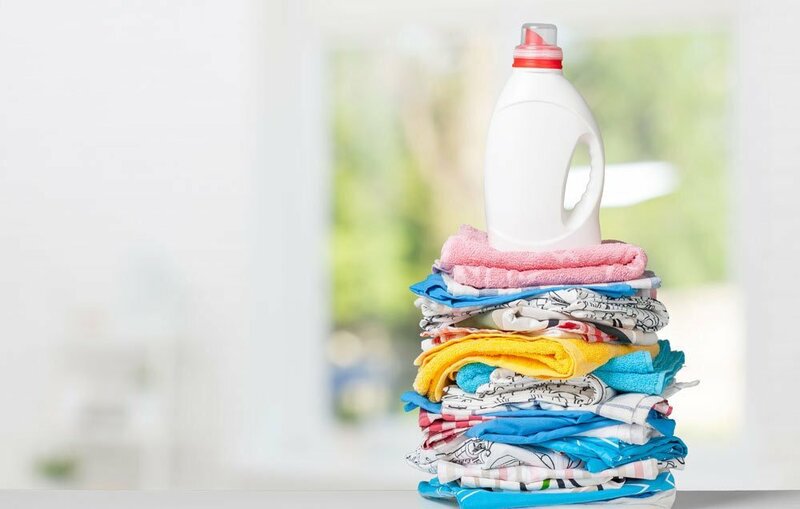 Because laundry-care product manufacturers are not required to list all laundry detergent ingredients on packaging, it can be difficult for consumers to make informed choices. The term “fragrance” alone may refer to a combination of several hundred laundry chemicals including many that are hazardous. Laundry detergents are often derived from petrochemicals and contain synthetic fragrances, even when advertised as “fragrance-free.” Most companies add optical brighteners to detergent formulas—additives that emit blue light, making whites appear whiter by tricking the eye. By design, optical brighteners stay in clothes after washing, which may cause skin irritation. They also decompose relatively slowly and can be toxic to marine life. Fabric softeners are also designed to stay in clothes and not fully rinse out, which means lingering chemicals come into contact with skin. Unfortunately, few of the chemicals used in laundry-care products have been thoroughly tested, particularly in combination with other chemicals, and some chemicals that have been shown to be harmful are still widely used. The U.S. government has taken a largely “innocent until proven guilty” approach to the use of chemicals in commerce, and the Environmental Protection Agency (EPA) has required testing on only a small portion of all the chemicals used in commerce since the Toxic Substances Control Act (TSCA) was passed in 1976. Only once it is determined that a chemical may present “unreasonable risk to human health or the environment” can the EPA regulate or ban it. Even if not all laundry detergent ingredients are disclosed on product packaging, it is still possible to gain useful information from laundry product labels. Our Laundry Chemicals to Avoid chart offers a list of harmful laundry chemicals to avoid, many of which are frequently listed on product labels. To protect your health and the environment, choose vegetable-based laundry products (see Resources at the end of this article). Or make your own homemade laundry soaps from safe ingredients such as castile soap and washing soda (see recipe below). It’s also wise to avoid conventional dry cleaning, which relies on the chemical perchlorethylene (perc). Instead, opt for a “green” dry cleaner, or reduce dry-cleaning needs using the tips listed later in this article. This simple, homemade detergent is inexpensive to make and free of harmful chemicals. Combine baking soda, washing soda and soap flakes. If using, add essential oil and mix with a wire whisk. Use 1/8 cup per load. Yield: This recipe makes enough powder to last a typical family of four for one year.